It seems way too early to be thinking about Christmas. Here in Wagtail the days are hot. Dogs are swimming and boating, and cats are lounging in the shade because the sun is too hot. It's still prime vacation time. But today I started receiving the merchandise that we'll be selling at the Christkindl Market! Even though it's far too early, I'm having fun looking through the ornaments in the shapes of dogs and cats. And there are adorable outfits for them, too. I bought an elf hat and matching jacket for my Jack Russell Terrier, Trixie! It suits her personality so well. The inn cook will be baking special Christmas cookies for dogs and cats. I'm getting a box of special holiday collars, too. Fancy collars with bling, and dog dresses with ruffles! How cute is that? And guess what? My heartthrob Holmes is coming home for Christmas this year! No wonder I'm dreaming of it already. I just know it's going to be very special. Just in case you missed Mission Impawsible, Krista says I can give away a copy! Leave a comment with your name and email address so she'll know where to find you if you win. What a cute cover! I enjoy looking forward to holiday cozies! And I do need to catch up, so thanks for the chance to win! Love the cover and look forward to reading! mcastor07(at)Gmail(dot)com. Wonder what Trixie thinks about the hat and jacket? I am now ready to get back to reading books after many many months with really bad vision that two surgeries and many procedures besides have helped me to read again. I would love to read this book if I were selected. Thank you. I love all of Krista Davis' books. They are so fun. 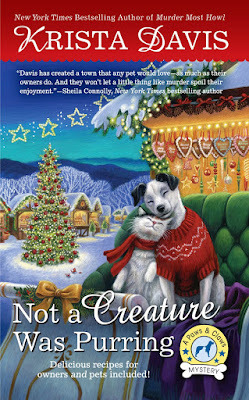 This looks like a great read and I do love holiday cozies. Very cute cover and it sounds real good. I love the cover! Thanks!!! Thank you for having the contest. Love the dog Trixie and the cute cat. monstercreed1@yahoo.com. I'm not ready for winter yet. love the cover and would love to read the book. Wow! What a great cover! Can't wait to read more about Wagtail, especially at Christmas time. Sounds like an amazing read. It's never too early to start thinking about Christmas, especially during the hot summer. It's never too early for Christmas. Loving this thank you. I love that cover! And I want to spend Christmas in Wagtail. I love the cover of this book!! Thanks for the giveaway and a chance to win.